I was recently sent a text with the following question. Great question! This is a super thorny passage because of the controversial doctrines involved here. This is a good opportunity for me to write a little bit about the doctrine of foreordination as well as predestination and election. These doctrines bring comfort to some and anger to others. 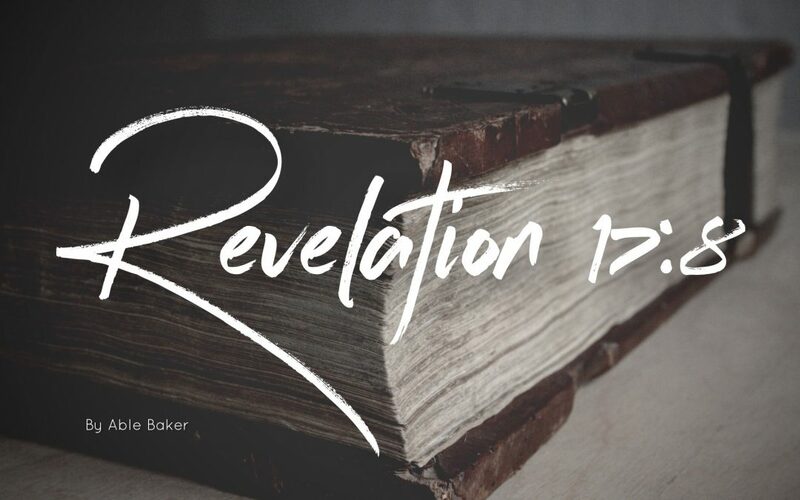 Because many people avoid the book of Revelation passages like Revelation 17:8 go unnoticed. Which is a shame because the whole book points toward the glory of the sovereign God who is in control and has a plan for all things! To start with let’s look at Ephesians 1:4-12. God has established events and outcomes before they even happen. Christians for almost two thousand years have referred to this unique activity and ability of God as “foreordination”. All of God’s actions and plans concerning his provision and grace will happen without fail to those whom he wills just as he has planned. In the end his plan for his creation, including who will be saved from the coming judgment, will be the only plans that actually pan out (Eph 1:11) everything else will be like squelched meaningless noise. Christians have used words like “Election” and “predestination” to refer to the topic of foreordination concerning the ultimate fate of people. Ephesians 1:4-12 gives us a glimpse into the mystery of foreordination, predestination and election. This is not a popular thought in every room of the household of faith. If you are anything like me it can be comforting at times to dream of some kind of control over things that we have no control over. We like to be the one behind the steering wheel so to speak. However, In the grand scheme of things concerning a believer’s ultimate redemption and right standing with God not one celebrating believer having overcome the final judgment will be able to say, “I did it!” nor will they be able to say “we (God and I) did it!”. Everyone saved and unsaved or all who overcome will only be able to say something like, “God has done this work of grace for the praise of His glory through the blood of the lamb”. According to Ephesians 1:4-12 those whom God has chosen to adopt will find that the check didn’t bounce or in other words God’s word is sure and trustworthy. Even though God knows the beginning from the end his image bearers are still free to participate within the hedges of his knowledge, power and plan. A person might ask, “How is freedom possible within the confines of foreordination, predestination and election?” No human can really answer the question for the same reason my guitar can never accuse me of stealing one of it’s songs. As instruments created for the hands of our creator many of the “how” questions are way beyond our pay grade. Perhaps a better question is “Who makes this freedom possible?”. We cannot not read Genesis’ creation account for example and find a satisfying answer to the question “How were the heavens and the earth made?” (other than God made them) but we can find an answer to the question “Who made the heavens and the earth?”. Our freedom comes with boundaries or limitations and we gain more understanding from questions with respect to our actual context as created beings rather than some imagined context outside of ourselves belonging only to the creator. Everything is playing out toward the eventual marriage of heaven and earth in the new creation. All of creation is held within the confines of what God has predetermined concerning the adoption of his kingdom family, his redeemed sons and daughters. John is showing that those who were not written in the book of life (before the world was made) will respond to the beast in predictable fashion. No surprises here they (the unwritten) will easily and ultimately be won over by the miracles and power of the beast(s) (anti-Christian Rome and future anti-Christian powers). God in his divine power has foreordained that those not written in the book of life who persecute God’s faithful people will, like Judas Iscariot, find themselves to be simply tools in the real Masters hand. So, back to the great question I was asked about Revelation 17:8 “…what does it mean ‘Whose names have not been written in the book of life from the creation of the world’?”. I interpret John to be saying that if one is not written in the book of life, which was written before the creation of the world, then one will not personally obtain the predestined inheritance mentioned above in the context of Ephesians 1:4-12.